Welcome to Universal Networks! Our network of sites offer resources such as free tools for your web site, a Christian portal and customizable start page service, a journal to help you migrate to open source, and web site design. Looking for a more powerful solution for your site's guest book? Then choose GuestCall, a functionally complete, but simple to install open source solution. Learn more about all of our OpenScript™ solutions by clicking here. Would you consider taking two minutes to help us better tailor our services around your needs? Please click here to take our quick, easy, and anonymous survey. StatsPlus provides a convient way to get indepth statistics about visitors to your site. 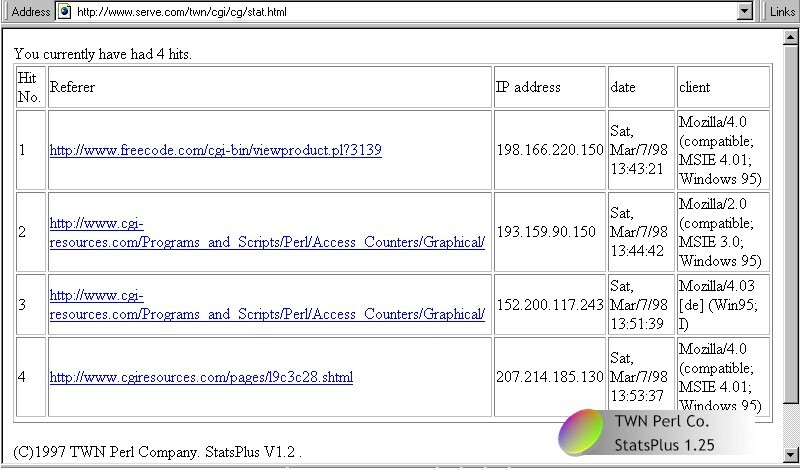 Statistics Produced by StatsPlus are similar to those from a server log, only they are placed neatly into an HTML table for you to view. Need help? We have that covered too, all Uninet scripts have FREE tech support! Please click the image below to rate StatsPlus! © 1996-2008 Universal Networks, All Rights Reserved. Uninet, Universal Networks, the Dynamic Swoosh logo, and Web Site Solutions are trademarks of Universal Networks. Links to external sites do not necessarily constitute the opinions of Universal Networks or it's affilates.